Western blot analysis of extracts from various cell lines using Phospho-Rpb1 CTD (Thr4) Antibody. 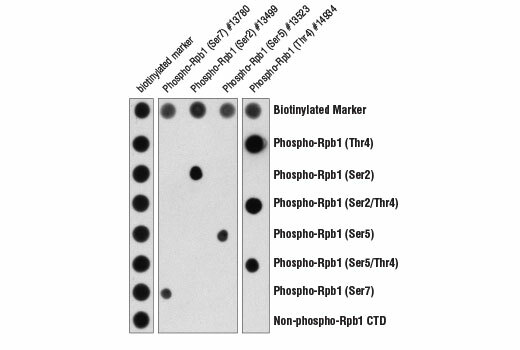 Peptide dot blot analysis demonstrating Phospho-Rpb1 CTD (Thr4) Antibody specificity. Antibody binding to pre-coated Rpb1 CTD peptides is shown using Phospho-Rpb1 CTD (Ser7) (E2B6W) Rabbit mAb #13780, Phospho-Rpb1 CTD (Ser2) (E1Z3G) Rabbit mAb #13499, Phospho-Rpb1 CTD (Ser5) (D9N5I) Rabbit mAb #13523, and Phospho-Rpb1 CTD Thr4 Antibody #14934. 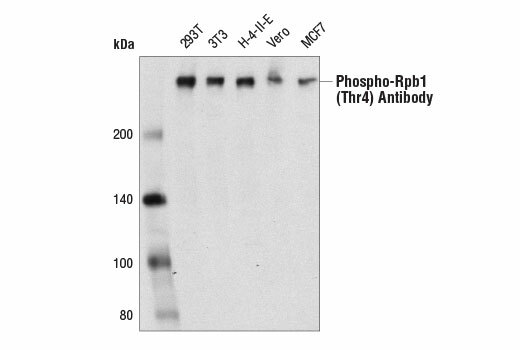 As expected, the Phospho-Rpb1 CTD (Thr4) Antibody only binds to phospho-Rpb1 CTD peptide when phosphorylated at Thr4. Phospho-Rpb1 (Thr4) Antibody recognizes endogenous levels of Rpb1 protein only when the carboxy-terminal domain (CTD) heptapeptide repeat [Tyr1, Ser2, Pro3, Thr4, Ser5, Pro6, Ser7] is phosphorylated at Thr4. This antibody does not cross-react with Rpb1 CTD phosphorylated at Ser2, Ser5 or Ser7. Polyclonal antibody is produced by immunizing animals with a synthetic phosphopeptide corresponding to residues surrounding Thr4 of human Rpb1 CTD heptapeptide repeat. Antibodies are purified by protein A and peptide affinity chromatography. RNA polymerase II (RNAPII) is a large multi-protein complex that functions as a DNA-dependent RNA polymerase, catalyzing the transcription of DNA into RNA using the four ribonucleoside triphosphates as substrates (1). The largest subunit, RNAPII subunit B1 (Rpb1), also known as RNAPII subunit A (POLR2A), contains a unique heptapeptide sequence (Tyr1,Ser2,Pro3,Thr4,Ser5,Pro6,Ser7), which is repeated up to 52 times in the carboxy-terminal domain (CTD) of the protein (1). This CTD heptapeptide repeat is subject to multiple post-translational modifications, which dictate the functional state of the polymerase complex. Phosphorylation of the CTD during the active transcription cycle integrates transcription with chromatin remodeling and nascent RNA processing by regulating the recruitment of chromatin modifying enzymes and RNA processing proteins to the transcribed gene (1). During transcription initiation, RNAPII contains a hypophosphorylated CTD and is recruited to gene promoters through interactions with DNA-bound transcription factors and the Mediator complex (1). The escape of RNAPII from gene promoters requires phosphorylation at Ser5 by CDK7, the catalytic subunit of transcription factor IIH (TFIIH) (2). Phosphorylation at Ser5 mediates the recruitment of RNA capping enzymes, in addition to histone H3 Lys4 methyltransferases, which function to regulate transcription initiation and chromatin structure (3,4). After promoter escape, RNAPII proceeds down the gene to an intrinsic pause site, where it is halted by the negative elongation factors NELF and DSIF (5). At this point, RNAPII is unstable and frequently aborts transcription and dissociates from the gene. Productive transcription elongation requires phosphorylation at Ser2 by CDK9, the catalytic subunit of the positive transcription elongation factor P-TEFb (6). Phosphorylation at Ser2 creates a stable transcription elongation complex and facilitates recruitment of RNA splicing and polyadenylation factors, in addition to histone H3 Lys36 methyltransferases, which function to promote elongation-compatible chromatin (7,8). Ser2/Ser5-phosphorylated RNAPII then transcribes the entire length of the gene to the 3' end, where transcription is terminated. RNAPII dissociates from the DNA and is recycled to the hypophosphorylated form by various CTD phosphatases (1). In addition to Ser2/Ser5 phosphorylation, Ser7 of the CTD heptapeptide repeat is also phosphorylated during the active transcription cycle. Phosphorylation at Ser7 is required for efficient transcription of small nuclear (sn) RNA genes (9,10). snRNA genes, which are neither spliced nor poly-adenylated, are structurally different from protein-coding genes. Instead of a poly(A) signal found in protein-coding RNAs, snRNAs contain a conserved 3'-box RNA processing element, which is recognized by the Integrator snRNA 3' end processing complex (11,12). Phosphorylation at Ser7 by CDK7 during the early stages of transcription facilitates recruitment of RPAP2, which dephosphorylates Ser5, creating a dual Ser2/Ser7 phosphorylation mark that facilitates recruitment of the Integrator complex and efficient processing of nascent snRNA transcripts (13-15). Phosphorylation of the Rpb1 CTD heptapeptide repeat at Thr4 in is highly conserved from yeast to mammals. However, research studies using Thr4 phosphorylation-mutant Rpb1 proteins suggest different roles for this modification among species. While phosphorylation of Thr4 in yeast is not essential (16,17), Thr4 mutants in chicken and mammalian systems result in RNA processing errors and global defects in RNA elongation (18,19). Threonine 4 is directly phosphorylated by polo-kinase3 (PLK3) and cyclin dependent kinase-9 (CDK9) activity is thought to either directly or indirectly lead to the phosphorylation of this site (18,19). Brookes, E. and Pombo, A. (2009) EMBO Rep 10, 1213-9. Komarnitsky, P. et al. (2000) Genes Dev 14, 2452-60. Ho, C.K. and Shuman, S. (1999) Mol Cell 3, 405-11. Ng, H.H. et al. (2003) Mol Cell 11, 709-19. Cheng, B. and Price, D.H. (2007) J Biol Chem 282, 21901-12. Marshall, N.F. et al. (1996) J Biol Chem 271, 27176-83. Krogan, N.J. et al. (2003) Mol Cell Biol 23, 4207-18. Proudfoot, N.J. et al. (2002) Cell 108, 501-12. Chapman, R.D. et al. (2007) Science 318, 1780-2. Egloff, S. et al. (2007) Science 318, 1777-9. Egloff, S. et al. (2008) Biochem Soc Trans 36, 590-4. Baillat, D. et al. (2005) Cell 123, 265-76. Akhtar, M.S. et al. (2009) Mol Cell 34, 387-93. Egloff, S. et al. (2010) J Biol Chem 285, 20564-9. Egloff, S. et al. (2012) Mol Cell 45, 111-22. Stiller, J.W. et al. (2000) Yeast 16, 57-64. Schwer, B. and Shuman, S. (2011) Mol Cell 43, 311-8. Hsin, J.P. et al. (2011) Science 334, 683-6. Hintermair, C. et al. (2012) EMBO J 31, 2784-97.